When physicist Hans Bethe first heard of the atomic bomb project he thought it an impractical idea and he didn't want to get involved with it. He told a biographer after the war that, "I considered... an atomic bomb so remote that I completely refused to have anything to do with it." But he was also desperate to make some contribution to the war effort against the Nazis, especially after the fall of France. So in the summer of 1942, when Robert Oppenheimer pulled together a group of distinguished physicists to work at Berkeley on a design for the bomb, Bethe accepted the invitation. He and his young wife Rose drove across the country from Cornell University, where he was teaching, to California, stopping on the way to pick up their best friends Edward Teller and his wife Mici at the University of Chicago. When Bethe saw the atomic pile that physicist Enrico Fermi had built at the University he became convinced that the atomic bomb would probably work. 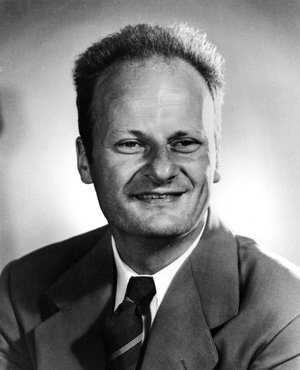 Hans Bethe was born in Strasbourg, Germany, in 1906, the son of a university psychologist. He started his university studies in Frankfurt in 1924 and in 1932 joined the faculty at Tübingen University. Almost as soon as Adolf Hitler became Chancellor of Germany in January 1933, hundreds of Jewish academics were fired from their jobs. Although Bethe didn't consider himself a Jew--his mother was Jewish his father wasn't--the Third Reich did. He learned of his dismissal from one of his students who read about it in the paper. Bethe was able to find another position in Munich with his mentor, Arnold Sommerfeld, but when Cornell University offered him an assistant professorship in the summer of 1934, he accepted and emigrated to America. It was in the 1930s that Bethe achieved his greatest accomplishment by developing a theory for the production of energy in stars. It was work for which he would receive a Nobel Prize in 1967. Following the summer at Berkeley spent on the atomic bomb design, Bethe was recruited by Oppenheimer to head the theoretical division at the new weapons laboratory that was being set up in Los Alamos, New Mexico. Teller was disappointed not to have been picked for the post himself. Bethe remembers that it, "was a severe blow to Teller, who... considered himself, quite rightly as having seniority over everyone then at Los Alamos." Tensions increased between the old friends, when Teller, who was supposed to be heading a group working on implosion calculations, began to concentrate instead on the feasibility of a hydrogen bomb. Following the success of the Manhattan Project and the end of the war, Bethe returned to Cornell to resume teaching and his academic research. When the Soviet Union conducted its first atomic test in August 1949, Teller went to visit Bethe in the hopes of persuading him to return to Los Alamos to work on the superbomb. Bethe agonized over the decision. But ultimately he concluded that in a war fought with hydrogen bombs, "even if we were to win it, the world would not be... like the world we want to preserve. We would lose the things we were fighting for." Bethe called Teller and told him he had decided against working on the project. Bethe remained vigorously opposed to the H-bomb throughout his life although, he continued to return to Los Alamos as a consultant. He became a member of the President's Science Advisory Committee in 1956, a position he held until 1959. It was in this capacity that he was involved in the failed negotiations with the Soviet Union for a ban on nuclear testing. Nevertheless, he has continued to argue for slowing down the arms race and for nuclear disarmament. In February 1997, as the Senate was preparing for a debate on the ratification of the Comprehensive Test Ban Treaty, the 90-year-old physicist wrote a letter to President Clinton, urging him to stop not only all tests of nuclear weapons but also the sponsorship of "computational experiments, or even creative thought designed to produce new categories of nuclear weapons." Of all the scientists who worked on the U.S. nuclear weapons program none have led more controversial a career than Edward Teller. Described by one Nobel Prize winner in physics as "one of the most thoughtful statesmen of science," and by another as "a danger to all that's important," Teller was recognized by most of his colleagues as being one of the most imaginative and creative physicists alive. But at the same time, his single-minded pursuit of the hydrogen bomb, and his autocratic style alienated many of the scientists he worked with. The man who would one day be known as the father of the hydrogen bomb in the U.S. was born into a Jewish family on January 15, 1908 in Budapest, Hungary. He grew up during a particularly turbulent time in Hungarian history. Following a briefly successful communist regime in 1919, the country was ruled by a virulently anti-semitic fascist dictator, Nicholas Horthy. The political upheavals meant the young Teller was only too happy to leave his homeland in 1926 to study in Germany. In 1930 he got his PhD in theoretical physics from the University of Leipzig. Although he accepted a research post in 1931 following his graduation, Teller realized that Hitler's rise to power meant that he should leave Germany as soon as he could. Many years later he told his biographer that "the hope of making an academic career in Germany for a Jew existed before Hitler came and vanished the day he arrived." In 1935 Teller emigrated to the United States to take up a teaching position at George Washington University. His first years in the U.S. marked a new phase of his career: His postdoctoral research had been in quantum mechanics; at George Washington University, he would begin a very productive collaboration with Russian emigré George Gamow in nuclear physics. At the outbreak of the Second World War, scientists became aware that the nucleus of a uranium atom could be split releasing enormous amounts of energy. It began to seem feasible that this energy could be used to create a weapon of unprecedented power. Teller was among the first scientists recruited to work on the Manhattan Project that was working to develop such a bomb. It was Italian-born physicist Enrico Fermi who first got Teller thinking about an H-bomb. In September 1941, before the United States had even built an A-bomb, he suggested to Teller that an atomic bomb might heat a mass of deuterium (an isotope of hydrogen) sufficiently to ignite a thermonuclear reaction. In the summer of 1942, when Teller joined a group of distinguished physicists who were brainstorming about a design for the atomic bomb, he diverted much of the discussion to the feasibility of a superbomb. Teller travelled to California with his old friend Hans Bethe who remembers that even on the way out to Berkeley Teller was already thinking about the super: "Teller told me that the fission bomb [atomic bomb] was all well and good and, essentially, was now a sure thing.. He said that what we really should think about was the possibility of...the hydrogen bomb." Shortly after Teller arrived at the newly established weapons laboratory in Los Alamos, his obsession with the H-bomb caused tensions with other scientists, particularly Bethe. Bethe remembers that "he declined to take charge of the group which would perform the detailed calculation on the implosion and since the theoretical division was very shorthanded it was necessary to bring in new scientists to do the work that Teller declined to do." Teller left Los Alamos at the end of the war, returning to the University of Chicago. But when the Soviet Union conducted its first test of an atomic device in August 1949, he did his best to drum up support for a crash program to build a hydrogen bomb. Teller argued that a superbomb was essential to the very survival of the U.S., "If the Russians demonstrate a super before we possess one, our situation will be hopeless." Truman eventually agreed, calling for a hydrogen bomb program at the end of January 1950. During the course of 1950, Teller was frustrated with the progress of the program. When his initial concept for the bomb didn't appear to work, he insisted that the problem was caused by a shortage of theoreticians at Los Alamos and a lack of imagination. These accusations served to further distance him from the other scientists. When he and mathematician Stanislaw Ulam finally came up with an H-bomb design that would work, Teller was not chosen to head the project. He left Los Alamos and soon joined the newly established Lawrence Livermore laboratory, a rival weapons lab in California. It was Robert Oppenheimer's security clearance hearings in 1954 that was the occasion for the final rift between Teller and many of his scientific colleagues. Oppenheimer, the scientific director of the Manhattan Project, had come under scrutiny because of his affiliation with left-leaning political organizations in the 1930s and also because of his consistent opposition to the hydrogen bomb. At Oppenheimer's hearings, Teller testified that "I feel I would prefer to see the vital interests of this country in hands that I understand better and therefore trust more." The testimony enraged many in the scientific community, who felt it was a terrible betrayal of the hardworking and loyal Oppenheimer. 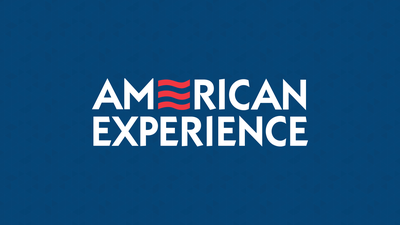 Teller has continued to be a tireless advocate of a strong defense policy, calling for the development of advanced thermonuclear weapons and continued nuclear testing. During the Vietnam War his proposals so incensed radical protestors that some of them actually labeled him a "war criminal." In the 1980s, he was a vigorous proponent of a proposed new defense system that came to be known as the Strategic Defense Initiative or more popularly as Star Wars. The story that his wife Laura tells, is that Enrico Fermi's interest in physics can be traced back to the death of his older brother Giulio when Fermi was just 14. The two boys, just a year apart in age, had been incredibly close. And Giulio's death left Enrico inconsolable. Shortly afterwards he found two old physics textbooks at market that were written by a Jesuit physicist in 1840. Fermi was so intrigued by them, he read them straight through, apparently, not even noticing that they were in Latin. From that point on, physics consumed him. When Fermi was 17 he applied to the University of Pisa. His entry essay was so advanced that it amazed the examiner who thought it suitable for a graduating doctoral student. In 1926 he became a professor of theoretical physics at the University of Rome. And in the 1930s, he began a series of experiments in which he bombarded a variety of different elements with neutrons. Fermi did not realize until later that he had, in fact, succeeded in splitting the uranium atom. It was for this work that the Nobel Committee awarded him the 1938 prize for physics. The call from Stockholm was a life-saver for the Fermi family. The night before, a bloody pogrom had taken place in Germany that became known as Kristallnacht. And just a few months earlier, the Italian Fascists had implemented a new anti-Semitic law that claimed: "Jews do not belong to the Italian race." Although Fermi wasn't Jewish, his wife Laura was. 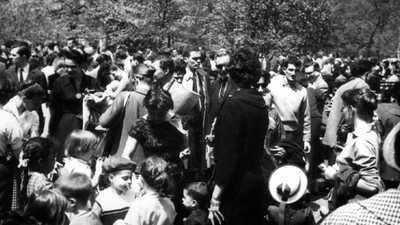 The award ceremony gave the family an opportunity to escape Italy and emigrate to America. At Columbia University in New York, Fermi realized that if neutrons are emitted in the fissioning of uranium then the emitted neutrons might proceed to split other uranium atoms, setting in motion a chain reaction that would release enormous amounts of energy. Together with Hungarian physicist Leo Szilard, Fermi ultimately succeeded in constructing the world's first atomic pile in a squash court under the stands of Stagg Field at the University of Chicago. And on December 2, 1942, it produced the first controlled, self-sustaining nuclear chain reaction. Fermi had succeeded in taking one of the first steps to making an atomic bomb. One of the participants at that momentous occasion wrote: "Even though we had anticipated the success of the experiment, its accomplishment had a deep impact on us. For some time we had known that we were about to unlock a giant; still we could not escape an eerie feeling when we knew we had actually done it." After working on the Manhattan Project during the war, Fermi was appointed to the General Advisory Committee, the panel of scientists that advised the Atomic Energy Commission. In October 1949, the GAC met to discuss whether the U.S. should initiate a crash program to build the superbomb. After the meeting, Fermi and Isidor Rabi co-authored a minority addendum to the committee's report. It described the H-bomb in the harshest possible language: "It is clear that such a weapon cannot be justified on any ethical ground... The fact that no limits exist to the destructiveness of this weapon makes its very existence and the knowledge of its construction a danger to humanity as a whole. It is necessarily an evil thing considered in any light." However, when President Truman ordered a crash program to build the superbomb a couple of months later, Fermi returned temporarily to Los Alamos to help with the calculations. He joined the effort hoping to prove that making a superbomb just wasn't possible. Robert Oppenheimer was born on April 22, 1904, into a wealthy, New York, Jewish family. They lived in an apartment overlooking the Hudson River and vacationed in a summer home on Long Island. As a 17-year-old, Oppenheimer went to Harvard where a classmate says he "intellectually looted the place." But it was after Harvard that Oppenheimer found his intellectual passion. First at Cambridge University in England and then at Göttigen University in Germany, the young American scholar began making his mark in quantum theory. By the time he returned to America, he'd published more than a dozen articles and established a reputation as a theoretical physicist. In the 1930s, Oppenheimer became drawn into left-wing politics. In part, this may have been a reaction to the rise of Nazism in Germany where his relatives were suffering under increasingly severe anti-semitic laws, but it may also have been a reaction to the Great Depression. Many of his students were unable to get jobs and Oppenheimer would say, "I began to understand how deeply political and economic events could affect men's lives." He got involved with a number of left-leaning organizations and began making an annual donation of about $1,000 to various funds associated with the Communist Party. When he joined the atomic bomb project he admitted in his security questionnaire that he had been "a member of just about every Communist Front organization on the West Coast." It was an admission that cast suspicion on him and eventually played a large role in the loss of his security clearance. 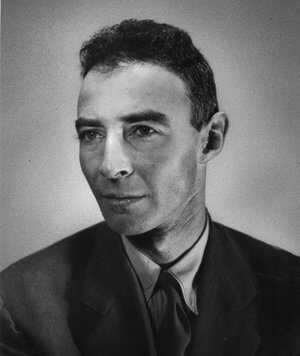 In 1941 Oppenheimer was brought into the atomic bomb project. His first task was to calculate the critical mass of uranium-235, i.e. the amount of uranium needed to sustain a chain reaction. The following summer he gathered together at Berkeley a small group of some of the best theoretical physicists in the country to talk about the actual bomb design. The group, which he dubbed the "luminaries," included Hans Bethe and Edward Teller. By the end of the summer they concluded that the bomb project would require a major scientific effort. General Leslie Groves, the army officer in charge of the bomb project wanted Oppenheimer to be the scientific director of the program, despite what he would call the "snag" of Oppenheimer's political past. After the war, he explained why: "He's a genius. A real genius... Why, Oppenheimer knows about everything. He can talk to you about anything you bring up. Well, not exactly. I guess there are a few things he doesn't know about. He doesn't know anything about sports." Together the two men picked out a site for a new laboratory for the project. It had to be isolated, but it needed to be easily accessible, it needed an adequate supply of water, and a moderate climate for year-round construction. Oppenheimer took Groves to a boys' school on a mesa in the New Mexico desert, which he had visited as a young man. The site became the location for the top secret Los Alamos weapons laboratory. By July 1945, Los Alamos was ready to test its bomb. Oppenheimer sent a cryptic telegram to scientists back at Berkeley: "Any time after the 15th would be a good time for our fishing trip...As we do not have enough sleeping bags to go around, we ask you please do not bring anyone with you." The test, code-named "Trinity," took place on July 16. It exploded with a force equivalent of 18,000 tons of TNT. Recalling the scene, Oppenheimer said: "A few people laughed, a few people cried, most people were silent. There floated through my mind a line from the "Bhagavad-Gita" in which Krishna is trying to persuade the Prince that he should do his duty: "I am become death: the destroyer of worlds." After the war Oppenheimer achieved nation-wide recognition as the "father of the A-bomb," and he was widely quoted as the moral conscience of those who had worked on the project. "In some sort of crude sense, which no vulgarity, no humor, no overstatement can quite extinguish," he would say, "the physicists have known sin, and this is a knowledge which they cannot lose." He also rose to prominence as a scientific advisor to the Federal Government. He pushed hard for international control of atomic energy, and was appointed Chairman of the General Advisory Committee to the Atomic Energy Commission. It was in this role that he voiced strong opposition to the development of the H-bomb. His political past and his resistance to the hydrogen bomb ultimately had devastating consequences for his career. In 1953, the Atomic Energy Commission suspended his security clearance. Despite testimonials from scores of witnesses during the hearings, his clearance was not reinstated. Oppenheimer returned to academic life, but as one colleague would say, the public ordeal had broken his spirit. One night in 1946, Stanislaw Ulam, a young mathematics professor was overwhelmed by a violent headache. When he tried to talk he found he could produce nothing but a meaningless mumble. He was rushed to a hospital where the surgeon drilled a hole in his skull and found his brain in an acute state of inflammation. The doctors applied penicillin liberally and Ulam lapsed into a coma. The diagnosis was encephalitis. And Ulam's wife and friends worried that he would suffer permanent brain damage. But that was far from the case. The mathematician went on to produce some of his best work after his recovery. And, in fact, it was playing solitaire while convalescing, that Ulam first thought up the "Monte Carlo" method. Together with an old friend, mathematician John von Neumann, Ulam developed the procedure into an extremely useful calculating tool that enabled mathematicians to solve complicated problems by making approximations. It was put to almost immediate use by scientists working on nuclear weapons. Ulam had first come to the United States from Poland for a few months in 1935 at von Neumann's invitation to work at the Institute of Advanced Studies in Princeton. He left his homeland for good in 1939 with his 16-year-old brother Adam. His father and uncle saw them off. It was the last time the brothers ever saw either men. Along with the rest of the Ulam family, they became victims of Hitler's holocaust. In 1943 Ulam received a letter from physicist Hans Bethe offering him a job doing some war work. He remembers the letter was cryptic, "I received an official invitation to join an unidentified project that was doing important work, the physics having something to do with the interior of stars." The location was Los Alamos, New Mexico, the assignment: making an atomic bomb. After a brief stint teaching at the University of Southern California, Ulam returned to the weapons laboratory at Los Alamos in 1946. And when President Truman announced in January 1950 that the United States was about to embark on an all-out effort to develop a hydrogen bomb, Ulam began calculating whether physicist Edward Teller's design for the superbomb would work. He comments: "We filled page upon page with calculations... I do not know how many man hours were spent on this problem." Ultimately, Ulam and a fellow mathematician Cornelius Everett concluded that Teller's model was a "fizzle" and that it would never work. The results caused tensions between Ulam and Teller. But a year later Ulam accidentally came up with a new scheme that would prove to be a breakthrough, and he reluctantly took it to Teller. Teller recognized that, though there were problems with the idea, Ulam had hit on the solution. Together the two men converted it into a design for the superbomb that everyone at Los Alamos immediately recognized would work. Their plan was to place an atom bomb inside a heavy shell that would also contain a capsule of hydrogen fuel. When the atom bomb exploded, in the fraction of a second before the whole assembly blew itself apart, the shell would confine the radiation from the atomic blast long enough to heat and compress the hydrogen fuel, setting off a fusion reaction. Central to Ulam's idea was the use of material surrounding the fuel capsule that would magnify the energy of the radiation. Decades later physicist Hans Bethe wrote: "The new concept was to me, who had been rather closely associated with the program, about as surprising as the discovery of fission had been to physicists in 1939... Such miracles incidentally do happen occasionally in scientific history but it would be folly to count on their occurrence." His colleagues at the atomic weapons laboratory in Los Alamos, New Mexico, remembered Klaus Fuchs as a shy, reclusive man, and an exceptionally talented scientist who worked extremely hard. And so most of them were stunned and horrified when, in February 1950, he was charged with having given atom bomb secrets to the Soviets. In his confession, attempting to explain the terrible betrayal of his friends, colleagues and adoptive country, Fuchs said that his father had taught him to stand up for what he believed, even if his beliefs were at odds with accepted convention. And that, Fuchs explained, was why as a student in Germany, he'd joined the Communist Party. He was convinced the Communists were the only political organization able to fight the increasing influence of the Nazis. 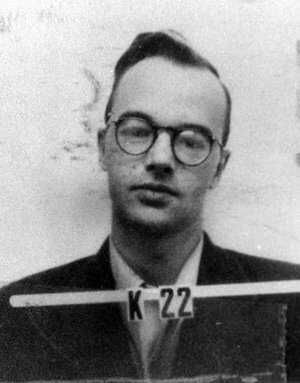 Klaus Fuchs was born on December 29, 1911 in Rüsselsheim, Germany. His father was a Lutheran minister who was deeply committed to socialist ideology. The younger Fuchs became interested in politics as a student. 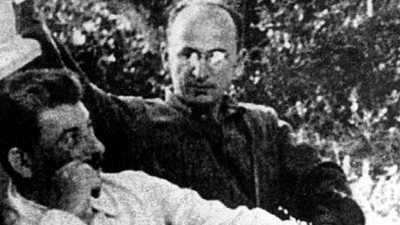 Once Adolf Hitler became Chancellor of Germany in 1933, Fuchs' political affiliations made him a target for the Nazis. He went into hiding for several months before escaping to Britain via France. Years later he explained that the Communist Party sent him out of Germany. "They said I must finish my studies because after the revolution in Germany people would be required with technical knowledge to take part in the building up of the Communist Germany." Fuchs quickly proved himself to be a brilliant young scientist. After receiving a PhD in physics from the University of Bristol, he was recruited to work in Edinburgh with one of the pioneers of quantum mechanics. After the war broke out, even though his communist past was known, the British granted him security clearance and he was recruited to work on the atom bomb. In his confession, Fuchs remembers being asked to help, "on some war work. I accepted it and started work without knowing at first what the work was... When I learned the purpose of the work I decided to inform Russia and I established contact through another member of the Communist Party." In 1943 Fuchs was among the British scientists sent to the U.S. to collaborate with Americans working on the atom bomb. At first he was assigned to a team at Columbia University in New York. Later he was transferred to the weapons laboratory in Los Alamos, New Mexico, where he worked in the theoretical division under Hans Bethe. He couldn't have been better placed to provide the Soviets information about the U.S. atomic bomb program. Fuchs made contact with a Soviet courier almost as soon as he'd arrived in the U.S, a man he knew only as Raymond, but who was in fact Harry Gold. Fuchs and Gold met several times. At one meeting in Santa Fe, Fuchs gave Gold a precise drawing with measurements of the "Fat Man" bomb, the bomb the United States dropped on Nagasaki at the end of World War II. After the war ended, Fuchs made sure he understood everything U.S. scientists knew about making hydrogen bombs. In April 1946, he attended a top-secret, three-day conference at Los Alamos that reviewed the wartime work on the superbomb. Shortly afterwards he filed a patent with mathematician John von Neumann for an initiator for the hydrogen bomb. And then just before returning to Britain he reviewed every document in the Los Alamos archives on thermonuclear weapons design. In Britain, Fuchs began working at the Harwell Atomic Research facility. But it didn't take him long to reestablish his Soviet contacts. In September 1947, he met with his new intelligence agent, Alexander Feklisov, in a north London pub. Asked ten questions about the superbomb, Fuchs described to Feklisov certain structural characteristics of the weapon. In March of 1948, he met Feklisov again. This time he handed over material that some Russian physicists now say proved to be of great importance to the Soviet hydrogen bomb. It contained a detailed description of the classical Super, as the first design for the hydrogen bomb was known, as well as Fuchs' own concept for an initiator. Fuchs' world finally began falling apart at the end of 1949. On December 21, a British intelligence officer informed the physicist that he was suspected of having given classified nuclear weapons information to the Soviet Union. Fuchs repeatedly denied the accusations, but he ultimately broke down and agreed to make a statement. He was brought to trial at the Old Bailey in London, where the audience included some 80 newspaper reporters, two U.S. Embassy representatives, the mayor of London and the Duchess of Kent. The chief prosecutor was Attorney General Hartley Shawcross who was widely known for his role at the Nuremberg Trials. The trial lasted less than two hours. Fuchs pleaded guilty. He said that he had not wanted to hurt his friends at Harwell, and that he hoped his confession would help atone for his wrongdoing. Until shortly before his trial began, Fuchs assumed the maximum penalty for his crimes was death. In fact, since the USSR had not been an enemy at the time of the crimes for which Fuchs was charged, under British law he could only be sentenced to 14 years. He was released from prison after nine and immediately left Britain for East Germany where he resumed his scientific career. Isidor Rabi was awarded the Nobel Prize for physics in 1944 for developing a method of measuring the magnetic properties of atoms, molecules and atomic nuclei. This research made possible the subsequent development of the laser and the atomic clock. During the war Rabi worked at the Radiation Laboratory of the Massachusetts Institute of Technology developing radar. He turned down an invitation to become the deputy director of the Manhattan Project, although, he did visit the weapons laboratory at Los Alamos to consult with the scientists working on the atomic bomb program. After the war, he pushed hard for the international control of atomic energy and he vigorously opposed the development of the hydrogen bomb. In 1954, the United States Federal Civil Defense Agency instituted an exercise called Operation Alert. It was a civil defense drill that took place on the same day in scores of major cities. In April of 1946 about 30 scientists attended a top-secret, three-day conference at Los Alamos, to review the work that had been completed at the weapons laboratory on the hydrogen bomb during World War II. Learn more about the major players and occurrences that led to the development of the Hydrogen bomb- this feature details Russian government officials.